Riverstone Montessori students have opportunities to learn through real experiences and develop an advanced understanding of the world around them. Text books are rarely used in the Montessori classroom and the benefits of this are many. When a topic is discussed, students turn to classroom materials which provide hands-on activities for instruction or find the information through their own research at the library or on the internet. When they have become sufficiently familiar with a subject they can arrange a field study (usually only consisting of 3-6 students and not the entire class as Montessori is focused on individual and not class lesson plans) to study the subject in a real world setting. EXAMPLE: Students who study geography and the effects of water on land will first research the topic. They will use the land models in the classroom to observe the 3 dimensional structure of this concept and then build their own land masses and expose them to types of water erosion to observe the effects. They are then allowed to schedule and plan (the scheduling and planning are their responsibility) a field trip to a local canyon to see the effects first hand. While there, they would takes notes on their observations, draw or sketch the formations in a journal and take photographs. When they return to the classroom they would provide a Powerpoint presentation of their findings to the class so everyone might benefit from their knowledge. Through this single experience students will have been exposed to research skills (text and internet), science studies (geography, physics), art (model building, sketching, photography), writing (note taking, journaling, report preparation), presentation skills (Powerpoint design and presentation) and planning/preparation skills. 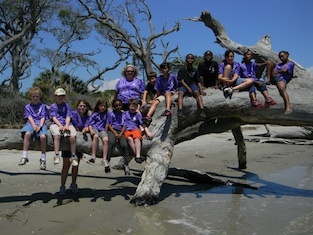 Since most field trips involve a group of students, they also work cooperatively to accomplish this task which instills values of teamwork and leadership. The Fine Arts are a perfect window to our world and provide a way to engage students in a meaningful study of human's history on the planet. Most notable works occurred during significant periods of human history. 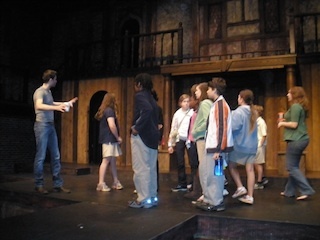 EXAMPLE: Our Elementary Students planning to attend an Atlanta Opera production will begin by learning the story in-depth, familiarizing themselves with the characters and the time period. They may act out the opera themselves, have a round table discussion of the character's motivations or do a story board drawing of the event. References to other historical events are researched and understood in the context of the opera. Time is taken to research the author and/or composer; who employed them and why this opera was produced. The students provide a presentation or possibly a performance to the class of what they have learned. Patrons are always pleasantly surprised at how well-behaved and engaged Riverstone students are at a performance. This is a direct result of being involved in the process of learning. During post performance question/answer periods with the cast, the performers have been taken aback at the depth of the questions they received from "elementary kids" on why they decided to perform a scene a certain way or change their character. Unlike a text book study, followed by a test, this hands-on approach engages the student in an experience involving all of their senses in a rewarding and enjoyable way. As a result, they retain more of the knowledge and look forward to learning more. Our Primary classes study the same types of concepts as the older students, but we bring the field trip in-house. Experts in music, science and the arts are brought to the classrooms to demonstrate their skills and provide information directly to the students. Middle School students running their own business complete with managers, staff, scheduling and managing their finances and checking account. Following a trial from beginning to end seated in the gallery of the Cobb County Courthouse to better understand the Justice system. Researching and visiting the many historic landmarks, geographic formations and eco-systems available in Georgia. Visiting local industries to better understand the science and mechanics behind the production of items we consume daily such as an industrial bakery, water treatment plant, or paper mill. Receiving certification in county water quality studies, monitoring and reporting of several local bodies of water. Middle School Ecology/Biology field study in Costa Rica. Elementary participation in a simulated United Nations Summit at the U.N. in New York, with the responsibility of researching and representing a specific nation. Animal and Plant Classification studies with biological specimens gathered from the local eco-systems. Music studies with visits to The Atlanta Opera, The Atlanta Symphony (including Music Theory, Compositional Work). Studies of History, Culture and Art at a variety of local museums in the area including the High, Fernbank, Emory University. 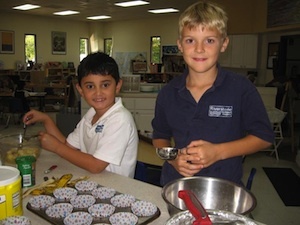 Baking Program to understand food preparation.